Yup! It's FINALLY HERE! 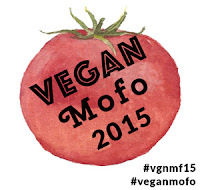 Vegan Mofo 2015! This is my 4 year participating...I believe! It's something I look forward to each year, indeed! I wish Vegan MoFo was EVERY MONTH but I know it takes a LOT of organization and I want to THANK the organizers of this annual event. Learn more at VeganMoFo.com. This year the organizers have developed prompts to get us going and I may post loosely based on these prompts but will be participating most days regardless. I may miss a weekend day from time to time but will do my best in the meantime! Before I get to my first post I wanted to let everyone know that I have started a BlogRoll for people who comment on my blog. The direct URL for this BlogRoll is located HERE. Or you can see the logo in this post on my sidebar, too! My goal is to network more and more with MoFo-ers each and every day and try and have lasting relationships year-round! Rise & Shine! It's MoFo Time! Tell us about your breakfast! Well, here it is! It's a "Handful Of" Smoothie! 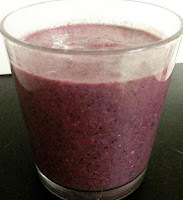 What I mean by that is I literally threw in a handful of all of the following to make this...Cashews, Blackberries, Blueberries, Strawberries, Raspberries...and added just enough Cashew Milk to cover it and blended! It's pretty yummy and I hope to make a Raw Vegan Ice Cream using these ingredients soon, too! I will be having a few (or more) of these dried apple slices! For course I am drinking various teas - like I normally do - throughout the day, too! 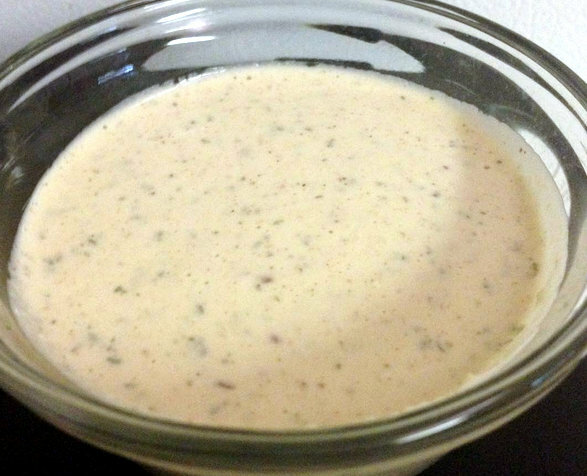 Lunch is yet to be determined but I'm guessing it will be a large salad because I made some pretty awesome tangy ranch dressing last night and it seemed to hit the spot with the thrown together salad I had last night for dinner, too! Here's a photo of the dressing. I will most likely be submitting this recipe to The Raw Food World NEWS Site and their Recipe Section very soon so hop over there and sign up for their daily email newsletter to recipe upcoming recipes! It's FREE! If you are new to my site here at My Blissful Journey and would like to see more of my recipes that I have contributed to The Raw Food World NEWS Site and their Recipe Section view my PROFILE here. 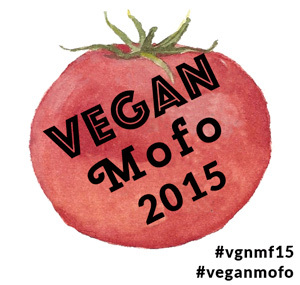 Again, I've VERY exited about this years Vegan MoFo! Please let me know if you are participating and/or if you would like me to add you to my personal BlogRoll for this event! Looking forward to any and all feedback and meeting some new veggie friends! Woot! I just posted my first ever Mofo post! I can't believe it. That smoothie looks great, as does the ranch dressing. I will have to check that site for the recipe. I still haven't found the perfect vegan ranch recipe. Thanks! This is more tangier than your average 'ranch' but I will be working on additional recipes to find something closer to actual ranch if that makes sense! LOL I'll be over later today to check out your post, too! Thanks again! I am looking forward to the VeganMoFo also! I love meeting new vegan people, near and far, during this month. Good luck to you this month! I look forward to reading your blog posts! Thanks so much! What's your URL? I'm really liking the theme idea. We are trying to stick to it on our blog too. Those apple slices are making me hungry. 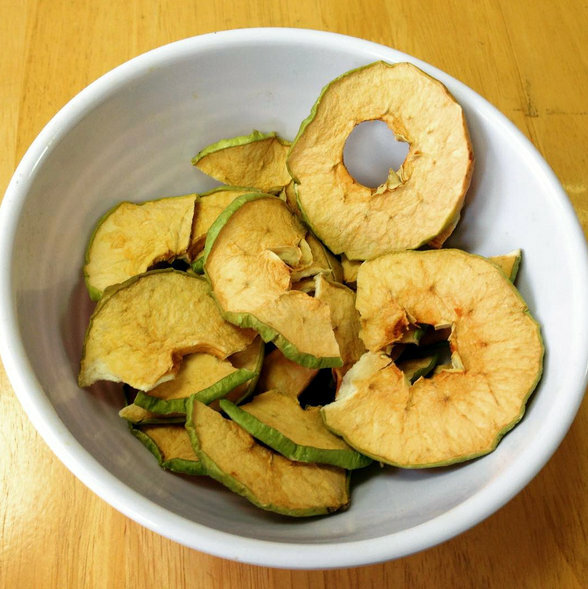 I don't know what it is, but I've been wanting dried apples lately. Good luck on your recipe submission! I hope you get in! Thanks! Yup! I'm a contributor to the website...I have lots of recipes there! Looking forward to submitting more, too! Yup! That's how I roll! teehee. Thanks and Happy MoFo to you, too! The portion seemed to work out ok too! Surprising! Your smoothie looks great! 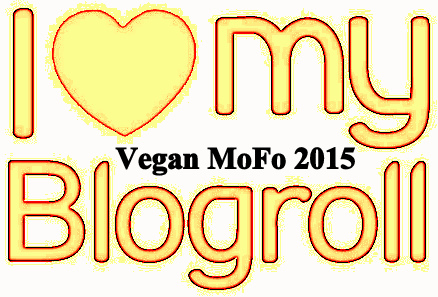 I love the "handful of" idea :) So excited for Vegan MoFo and to find your blog! Happy Vegan MoFo! Thanks so much for stopping by and commenting! I'm looking forward to your posts, too! Very cool on Vegan Mofo, such a great month! And the smoothie looks great and so does the dressing, thanks! Thank YOU! Looking forward to your posts as always! Not going to lie...I tend to do this a lot, too! Love the smoothie, looks like a great combination. Happy MoFo! Isn't VeganMoFo great! I'm so delighted that you shared your first day of VeganMoFo with us at the Plant-Based Potluck Party Link Up. I'm pinning and sharing.